I love these. 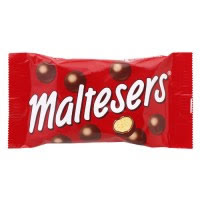 They're basically the British version of Whoppers but the chocolate is so much creamier. The ratio of chocolate to malt definitely favors chocolate in the British version, and I prefer it that way. Luckily, they seem to be carried all over NYC so I get to eat them regularly.